CHIKARAtopia lets you explore the rich history of CHIKARA by finding any event and match. 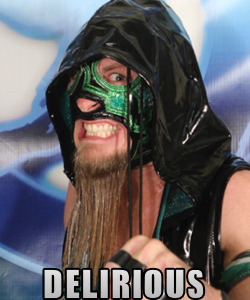 Use the links below to find matches and events that have shaped the career of Delirious. Chapter 11The Sordid Perils of Everyday ExistenceBattle of Who Could Care LessNew Star NavigationBruisedCibernetico & RobinMaximum OverdraftAniversario!